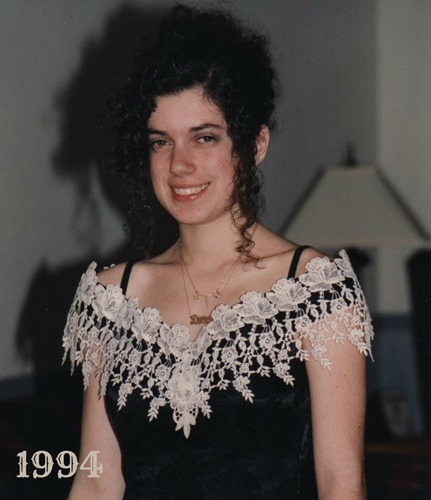 Flashback Feature #21–The 1990’s–And a Giveaway! I recently became friends with Annie, a fellow Kansan who blogs at Annie One Can Cook. Annie is so sweet and I’ve really enjoyed getting to know her since we virtually met. The one thing I did not realize about Annie is that on her birthday next week she will turn 23 years old – which means she was born in 1990. 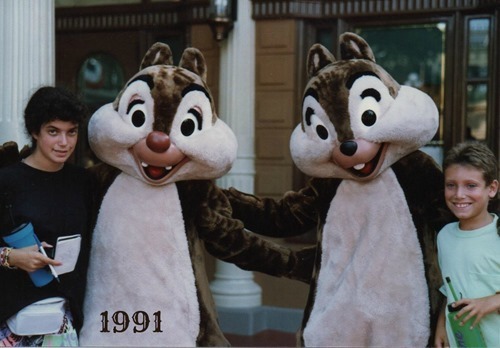 1990! Do you know how old I was in 1990? Like, old. Okay, not that old. I was 11. I turned 12 that November. 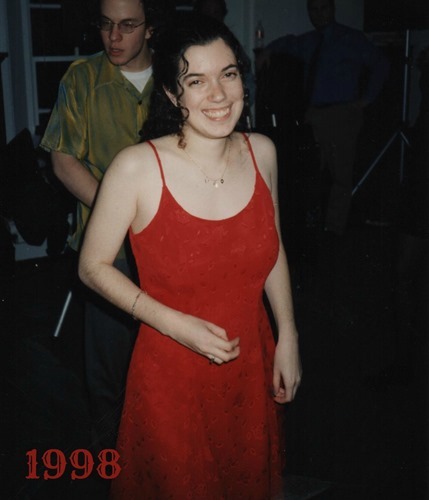 So, in honor of Annie’s birthday, this week’s Flashback Feature is all about the ‘90s. Don’t forget to read to the end for Annie’s birthday giveaway!! 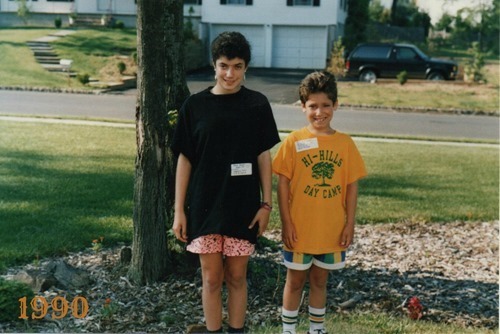 My brother and me on our first day of camp in 1990. In 1990 I graduated 6th grade. I finished elementary school and started jr. high. Beverly Hills, 90210 debuted. Madonna was controversial. Germany was reunified. Ryan White died of AIDS. Ice, Ice, Baby and Can’t Touch This were popular songs. I was in 7th grade and 8th grade. 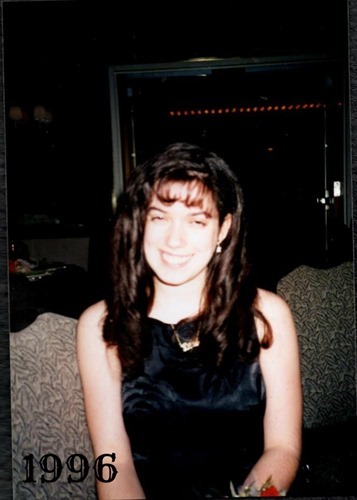 I got braces and had my Bat Mitzvah. I was watching 21 Jump Street when George Bush announced that the USA was invading Iraq. Everything I Do and Black or White were popular songs. Blossom and Clarissa Explains It All debuted. The USSR collapsed. 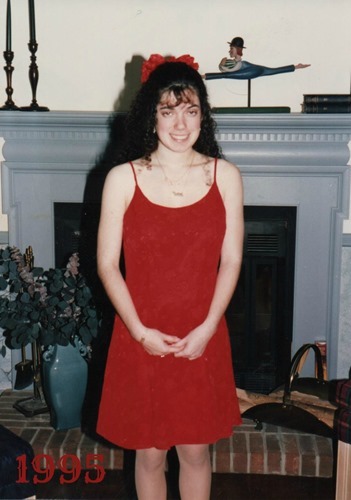 Dressed for the 8th grade dance. I don’t know why my head was cut off! I graduated 8th grade. Finished jr. high and started high school. There were riots in L.A. and Hurricane Andrew in Florida. Amy Fisher pled guilty. Melrose Place debuted. I Will Always Love You, End of the Road, and Smells Like Teen Spirit were popular songs. This is the day I got my braces off. I also was just getting over a week of chicken pox. 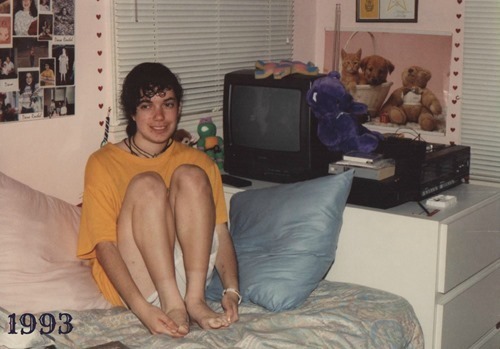 I was 14 years old. The first World Trade Center bombing occurred. I’d Do Anything For Love and What’s Up? were popular songs. Boy Meets World debuted. Lorena Bobbitt was on trial. Israel and the PLO signed a peace accord. OJ Simpson’s car chase interrupted game 5 of the NY Knicks vs the Houston Rockets – I was a huge Knicks fan at the time. Kurt Cobain killed himself. Streets of Philadelphia, Cotton Eye Joe, and All For Love were popular songs. A great year for TV – Friends, My So-Called Life, ER, and Party of 5 debuted. Nancy Kerrigan was attacked. Junior Prom. I swear I looked better than I do in this picture. The Oklahoma City Bombing occurred. Yitzhak Rabin was assassinated. I spent the summer in Israel. Jerry Garcia died. My brother had his Bar Mitzvah. I got my driver’s license. I saw REM in concert. I graduated high school and started college. I had Lyme Disease. The Olympics were in Atlanta and there was a bombing. TWA Flight 800 crashed. Wannabe and Killing Me Softly were popular songs. 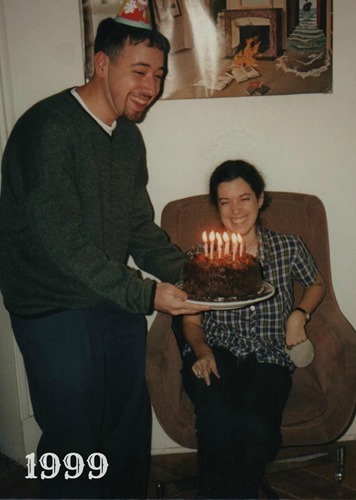 This was taken on my 19th birthday, just days after Dave and I started officially dating. 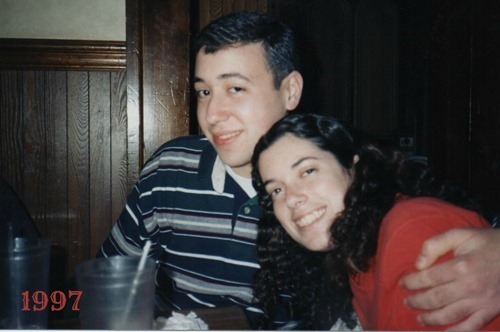 Early in 1997 Dave and I met on our winter break in Israel. I worked at Borders Books that summer. I saw The Who, James Taylor, and The Beach Boys in concert. Princess Diana and Mother Theresa died. Titanic was huge in the theaters. I’ll Be Missing You and Candle in the Wind (Princess Diana version) were popular songs. 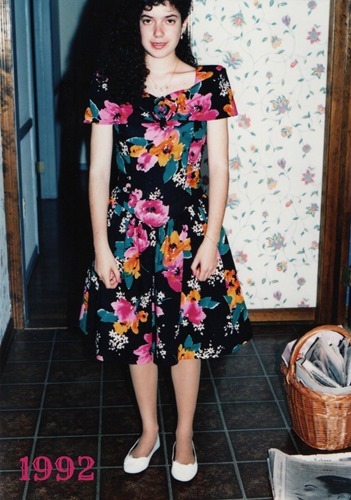 Please note I am wearing the same dress as in the 1995 picture. Bill Clinton and Monica Lewinsky were big in the news. Matthew Shepherd was killed. My Heart Will Go On and I Don’t Want To Miss a Thing were popular songs. Dawson’s Creek debuted. I spent more than half of 1999 in Israel studying abroad. That may be why I have very little memory of Columbine happening that April. I started my senior year of college. Who Wants to Be a Millionaire was popular. We experienced Hurricane Floyd. Everyone was worried about Y2K. Enough about me – on to the giveaway! 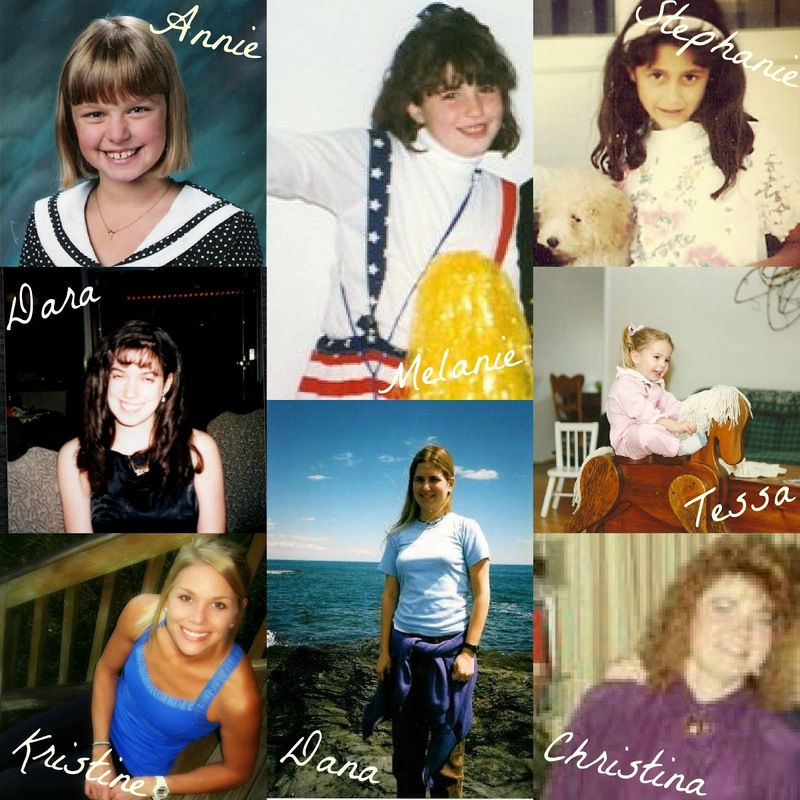 Kristine, Melanie, Christina, Dara, Stephanie, Dana, Tessa & Annie are ready to party like it’s 1990–are you?! All of the lovely ladies listed above have pitched in for an $80 gift card to Target! That’s an adorable new wardrobe! Or new home decor! Follow the Rafflecopter below to enter!